Just squeezing this episode in with minutes to spare - the choice of the first few tracks seemed to flow easily but it took me a long while to settle on what to include for the rest of the show. It goes from the sunny, to the abrasive, to the paranoid, and more besides, and all in under an hour - enjoy! Bay Area again! Only the instrumental here, but will definitely have to give you some E-40 in a future episode - he's an underappreciated MC, certainly in the UK where he's not well known at all. This beat (by E-A-Ski and CMT) swaggers and knocks in a defiantly West Coast fashion, grab a copy of the 12" if it's up your alley; here's the video with the full tune. Maybe I'm biased because Midnyte dissed Michael Jackson, but this is included more for the fit of the beat than the lyrics! This is a track out of Nottingham, Styly Cee being a veteran of their scene - Midnyte may be too but I've got to be honest, I don't know too much about him! This was on a 12" on Son Records with "Joyrider" on the A-Side - got the vinyl but I've just noticed you can buy it on Bandcamp as a download. I can't find where I originally read this, but one interviewer asked Ali about the metallic shaking noise ("like scissors") that runs throughout the beat, and he replied that it was the sound of chains - like slaves would have worn. That image has always stayed with me and comes to mind every time I hear this track, originally from his 2004 "Shaheedullah and Stereotypes" album. That bass is pretty serious, and Chip-Fu comes back from the Fu-schnickens days to deliver some decent material, although when he switches from singing to rhyming he seems to go off-topic? Another one of the many gifted Detroit producers (as well as a very solid MC). Love this one, that repeated vocal sample every bar is *just* right, everything on the track just seems to fit together as it should. No real hook, extended (for this era, anyway) cuts at the end, nice change from the standard verse/hook/verse/hook/outro structure. I've been looking for a place to fit this one in for a while, so here it is - only downer is now I can't play it on the show again! The "Parrish Making Dollars" part of EPMD with a sneaky little cut which I bet hardly anyone on here has heard! While Parrish is actually overlooked for his production and has cooked up many classics, this one was produced by the Ghetto Professionals (ex-Beatnut V.I.C and Mike Heron). Taken from the "The Awakening" album, picked it up cheap from somewhere - got a couple of good joints on there, worth a check at least. Quite a title, and a departure from everything else on Hijack's certified UK classic "The Horns Of Jericho" (which you should have if at all possible, at the time of writing it's not the cheapest though). Hijack are simply legends on the UK scene for what they did in their day. At a time when UK Hip-Hop was written off by many, they made enough noise that Ice-T came over to sign them to Rhyme $yndicate Records, and this is when Ice-T was unquestionably one of the biggest MCs on the scene. Though eventually the crew split up to do all sorts of different things, the album is a landmark. "Who?" you ask? Tribeca is a Bronx MC and producer who's done some great stuff but just isn't well-known enough; he's done tracks with Pharoahe Monch ("The Life") and Camp Lo ("Sunkiss" and "Army" to name two) and I'd love to hear him producing for more MCs. I don't know exactly how to describe it but he's just...dramatic, or maybe forceful? He's not too shy to use quite aggressive programming or to play with the panning on sounds in a dynamic style, and I have visions of him pounding on the MPC pads like a drumkit! Discovered this tune last month and decided it absolutely had to be on the next episode - it's on the soundtrack album to the film "Paid In Full" which is worth seeing, by the way. I bought a digital copy of this and don't know who did the beat, but it's dope; I especially love the stuttering feel on the second half of each four-bar segment, the first half just sets you up nicely waiting for it every time. Great chorus as well! PS - "Paid In Full" is worth seeing, but do read Azie Faison's "Game Over" which is the true story on which the film is very loosely based. This may be the only time you hear an Eminem production on the podcast! I've never taken to his beats at all but this one here works well with the concept of the spirits of the dead MCs filling in the lyrics. I got this on a 12" with some other Redman tracks but this is more readily available on Red's "Ill At Will Vol.1" mixtape/CD. Sorry about the sound quality - probably part bad pressing, part harsh cartridge? Something from this year for you; Primo on the beat and one of the foremost new MCs ripping the verses. It's dark, it's paranoid, it's brilliant. Me and my man Watch Deez disagree on the video for this though; I think it's genius and fits perfectly (and the style of the shots is similar to the style of photos I like to take), he thinks it could have been a lot better. What do you think? Heavyweight lineup here - B-side to the "Give The Drummer Sum" single, and the best track on there comfortably. Detroit native Black Milk handles the crunchy digital production and opening verse but Pharoahe and Sean P kill this one. "Kryptonite...but I'm a Blood today, Latin King tomorrow?" Oh hell no, that kind of line puts other MCs into retirement! 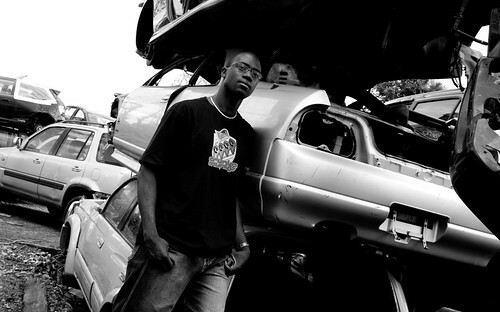 Despite an incredible number of setbacks, Slum Village still exists as a group these days, though T3 is the only remaining founder member after the passings of Dilla and Baatin. This track is from the 2005 self-titled album, with just T3 and Elzhi on the mic. Elzhi is definitely the man on this one, filling in all the gaps left in Black Milk's spare, thumping beat. Remember, if you like what you hear then please do support the artists - seeing them live is the best, and buying the music on whatever format suits you at the very least demonstrates that there's a market for it. If you're in a country where Spotify is available, do get it - it's a great way to hear stuff and be a bit adventurous!